2. Прочтите текст и скажите, о каких первых вычисли­тельных приборах рассказывается в нем. Let us take a look at the history of computers that we know today. The very first calculating device used was the ten fingers of a man's hands. This, in fact, is why today we still count in tens and multiples of tens. Then the abacus was invented. People went on using some form of abacus well into the 16th century, and it is still being used in some parts of the world because it can be understood with­out knowing how to read. During the 17th and I8lh centuries many people tried to find easy ways of calculating. J.Napier, a Scotsman, invented a me­chanical way of multiplying and dividing, which is now the modern slide rale works. Henry Briggs used Napier's ideas to • produce logarithm tables which all mathematicians use today. Calculus, another branch of mathematics, was independently invented by both Sir Isaak Newton, an Englishman, and Leib­nitz, a German mathematician. The first real calculating ma­chine appeared in 1820 as the result of several people's experi­ments. In 1830 Charles Babbage, a gifted English mathematician, proposed to build a general-purpose problem-solving machine that he called "the analytical engine". This machine, which Babbage showed at the Paris Exhibition in 1855, was an attempt to cut out the human being altogether, except for providing the machine with the necessary facts about the problem to be solved. He never finished this work, but many of his ideas were the ba­sis for building today's computers. Bureau and established his own tabulating machine company. Through a series of merges the company eventually became the IBM Corporation. Until the middle of the twentieth century machines designed to manipulate punched card data were widely used for business data processing. These early electromechanical data processors were called unit record machines because each punched card contained a unit of data. In the mid—1940s electronic computers were developed to perform calculations for military and scientific purposes. By the end of the 1960s commercial models of these computers were widely used for both scientific computation and business data processing. Initially these computers accepted their input data from punched cards. By the late 1970s punched cards had been almost universally replaced by keyboard terminals. Since that . time advances in science have led to the proliferation of com­puters throughout our society, and the past is but the prologue that gives us a glimpse of the nature. 3. Просмотрите текст еще раз. Ответьте на вопросы, ис­пользуя информацию текста. coding the data did Hollerith devise? 10. How were those elec­tromechanical machines called and why? 11. What kind of com­puters appeared later? 12. What new had the computers of 1970s? To compute, to invent, to know, to multiply, to divide, to depend, to solve, to provide, to process, to code, to punch, to collect, to design, to store, to contribute, to use, to manipulate, to assemble, to connect, to consume, to rely, to divide, to mul­tiply, to inform, to instruct, to discover, to operate. Computers using vacuum tubes; the machine calculating mathematical problems; the computer keeping instructions in its memory; binary code storing data and instructions; the vac­uum tube controlling and amplifying -electronic signals; com­puters performing computations in milliseconds; electronic . pulses moving at the speed of light; students coding the infor­mation by using a binary code; devices printing the information; keyboard terminals replacing vacuum tubes. The given information; the name given to the machine; the coded data; the device used in World War II; the invention named ENIAC; the machine called EDVAC; instructions kept in the memory; the engine designed for storing data; data stored in a binary code; vacuum tubes invented by J. Neumann; the general-purpose machine proposed by Ch. Babbage; the ma­chine provided with the necessary facts. ровых и аналоговых компьютерах. Переведите текст. In 1930 the first analog computer was built by American named Vannevar Bush. This device was used in Wbrld W&r II to help aim guns. Many technical developments of electronic digital comput­ers took place in the 1940s and 1950s. Mark I, the name given to the first digital computer, was completed in 1944. The man responsible for this invention was Professor Howard Aiken. This was the first machine that could figure out long lists of mathe­matical problems at a very fast rate. In 1946 two engineers at the University of Pennsilvania, J.Eckert and J.Maushly, built their digital computer with vacu­um tubes. They named their new invention ENIAC (the Elec­tronic Numerical Integrator and Calculator). Another important achievement in developing computers came in 1947, when John von Neumann developed the idea of keeping instructions for the computer inside the computer's memory. The contribution of John von Neumann was particu­larly significant. As contrasted with Babbage's analytical engine, which was designed to store only data, von Neumann's ma­chine, called the Electronic Discrete Variable Computer, or EDVAC, was able to store both data and instructions. He also contributed to the idea of storing data and instructions in a bi­nary code that uses only ones and zeros. This simplified com­puter design. Thus computers use two conditions, high voltage, and low voltage, to translate the symbols by which we commu­nicate into unique combinations of electrical pulses. Wfe refer to these combinations as codes. Neumann's stored program computer as well as other ma­chines of that time were made possible by the invention of the vacuum tube that could control and amplify electronic signals. Early computers, using vacuum tubes, could perform compu­tations in thousandths of seconds, called milliseconds, instead of seconds required by mechanical devices. 9. Просмотрите текст еще раз и ответьте на вопросы, ис­пользуя информацию текста. mean? 10. Due to what invention could the first digital com­puters be built? Цифровые компьютеры; технические усовершенствова­ния; совершенствование компьютеров; ответственный за изобретение; математические задачи; электронные трубки; важное достижение; запоминающее устройство; значи­тельный вклад; двоичный код; высокое напряжение; низ­кое напряжение; электрические импульсы; тысячная доля секунды. Происходить; завершать; вычислять; хранить команды внутри компьютера; запоминать информацию; запоминать команды; содействовать; использовать единицу и ноль; упрощать дизайн; усиливать сигналы; выполнять вычис­ления. Verbs: to name, to complete, to calculate, to develop, to keep, to interprete, to communicate, to fulfill, to apply, to trans­late, to improve, to build, to call, to store, to communicate, to figure out, to perform, to use, to finish, to construct, to con­nect. Nouns: speed, aim, storage, information, machine, signifi­cance, computation, data, device, rate, calculation, purpose, memory, importance. 12. Заполните пропуски необходимыми словами. 5. Neumann_____ the idea of storing data in a ^____ . ers could perform____ much faster. 1. Computers were designed to perform thousands of com­putations per second. 2. To make computers more reliable tran­sistors were used. 3. They were applied to reduce computation­al time. 4. To integrate large numbers of circuit elements into a small chip, transistors should be reduced in size. 5. To use in­tegrated circuit technology new computers were built. 6. 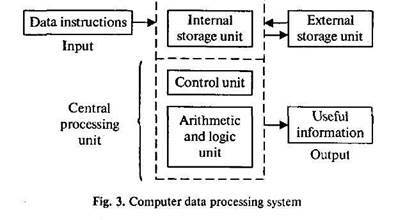 Ana­lytical engine was invented to store data. The problem to be solved; the work to be finished; the cards to be punched; calculations to be performed; the machine to be shown at the exhibition; the device to be provided with the nec­essary facts; computers to be used for data processing; efforts to increase reliability; electronics to connect systems and sub­systems; the speed of response to depend on the size of transis­tor; computers to perform thousands of calculations per second; vacuum tubes to control and amplify electric signals; these are circuits to use a large number of transistors; operations to be performed. 14. Выполните письменноперевод текста 3 повариантам. In 1832, an English inventor and mathematician Charles Babbage was commissioned by the British government to devel­op a system for calculating the rise and fall of the tides. Babbage designed a device and called it an analytical engine. It was the first programmable computer, complete with punched cards for data input. Babbage gave the engine the ability to per­form different types of mathematical operations. The machine was not confined to simple addition, subtraction, multiplication, or division. It had its own "memory", due to which the machine could use different combinations and sequences of operations to suit the purposes of the operator. tempts to build mechanical, general-purpose, stored-program computers throughout the next century. In 1941 a relay com­puter was built in Germany by Conrad Zuse. It was a major step toward the realization of Babbage's dream. In 1944 in the United States, International Business Ma­chines (IBM) built a machine in cooperation with scientists working at Harvard University under the direction of Prof. Aik-en. The machine, called Mark I Automatic Sequence-Con­trolled Calculator, was built to perform calculations for the Manhattan Project, which led to the development of atomic bomb. It was the largest electromechanical calculator ever built. It used over 3000 electrically actuated switches to control its operations. Although its operations were not controlled elec­tronically, Aiken's machine is often classified as a computer because its instructions, which were entered by means of a punched paper tape, could be altered. The computer could cre­ate ballistic tables used by naval artillery. The relay computer had its problems. Since relays are elec­tromechanical devices, the switching contacts operate by means of electromagnets and springs. They are slow, very noisy and consume a lot of power. The work on introducing electronics into the design of com­puters was going on. The gadget that was the basis for the first computer revolu­tion was the vacuum tube, an electronic device invented early in the twentieth century. The vacuum tube was ideal for use in computers. It had no mechanical moving parts. It switched flows of electrons off and on at rates far faster than possible with any mechanical device. It was relatively reliable, and operated hun­dreds of hours before failure. The first vacuum tube computer was built at Iowa University at about the same time as the Mark I. The computer, capable to perform thousands of related computations, was called ABC, the Atanasoff-Berry Comput­er, after Dr.John Atanasoff, a professor of physics and his assis­tant, Clifford Berry. It used 45 vacuum tubes for internal logic and capacitors for storage. From the ABC a number of vacu­um-tube digital computers developed. Soon the British developed a computer with vacuum tubes and used it to decode German messages. а) на русском языке; б) на английском языке. The first vacuum tubes computers are referred to as first gen­eration computers, and the approximate period of their use was from 1950 to 1959. UNIVAC 1 (UNF&rsal Automatic Com­puter) is an example of these computers which could perform thousands of calculations per second. Those devices were not only bulky, they were also unreliable. The thousands of vacuum tubes emitted large amounts of heat and burned out frequently. The transistor, a smaller and more reliable successor to the vacuum tube, was invented in 1948. So-called second genera­tion computers, which used large numbers of transistors were able to reduce computational time from milliseconds to microsec­onds, or millionths of seconds. Second-generation computers were smaller, faster and more reliable than first-generation com­puters. Advances in electronics technology continued, and micro­electronics made it possible to reduce the size of transistors and integrate large numbers of circuit elements into very small chips of silicon. The computers that were designed to use integrated circuit technology were called third generation computers, and the approximate time span of these machines was from 1960 to 1979. They could perform many data processing operations in nanoseconds, which are billionths of seconds. imprinted, after which the circuit is encapsulated in plastic or metal. -а) Компьютерыбыли созданы, чтобы выполнять вычисления для военных и научных целей.